Addition of zinc amalgam, Zn(Hg) and acid to a ketone results in an alkane. This is called the Clemmensen reduction. The Clemmensen reaction can be used to reducing an aryl ketone which is the product of a Friedel-Crafts acylation. It allows the deoxygenation of aldehydes or ketones, to produce the corresponding hydrocarbon. This reaction is only as effective on ketones that are adjacent to the aromatic system. 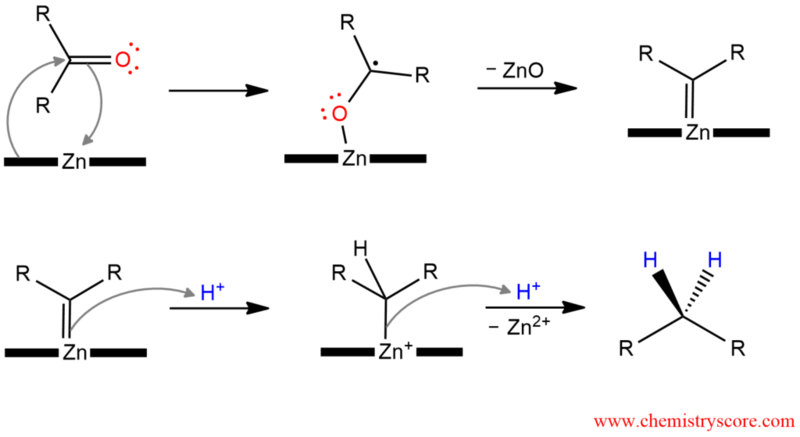 The Clemmensen reduction is complementary to the Wolff-Kishner reduction, which also converts aldehydes and ketones to hydrocarbons, in that the former is carried out in strongly acidic conditions and the latter in strongly basic conditions.